big and tall store | Keep It Up, David! I hated clothes shopping when I was 400 pounds. I hated how much I had to look in mirrors, I hated the shame I felt every time I was bigger than the largest size available, I hated every step of the process. It was the worst. There were a couple things that happened yesterday that really made me feel good about myself – and after this tough week (with my three-pound gain), they couldn’t have come at a better time. Lookin’ sharp, right? I love it. I’ve trusted Heather at Glendale Salon Spa with my hair for years now, and she’s never let me down. When I went up to the front desk to pay, Renee (the manager and quite possibly the owner – not sure) looked up from what she was doing and blurted out “Oh my god, you are so hot!” That was my cue to start blushing. Every once in a while, I catch an unexpected glimpse of myself – usually, it’s a reflection in a window or mirror, where, for a split second, I don’t realize that it’s ME, and all I see is this thin figure and I wonder who the hell it is, and it catches me off totally off-guard. Once I saw a shadowy figure in my bedroom and thought someone had broken into my house, and I was ready to bolt for the kitchen to grab a knife before it sunk in that the person that I saw was ME in a mirror. I suppose, living in this body every single day, that I’ve gotten accustomed to my own point-of-view, and I completely love and appreciate those moments, scary as they might be, when I see myself, and this body that I’ve worked so hard to change, from a different perspective. When I first looked at the above photos, on the little screen on my camera, I had one of those moments again. I saw the before picture and thought, ‘Who is that in the background? I don’t remember anyone else near us… WHOA! That’s me, in the mirror!” I zoomed in and looked again… at my long neck… the absence of additional chins… what appears to be pectoral muscles… and it felt really wonderful. There’s some glare from my flash – sorry about that! Starting from the top right and going clockwise, we have: pre-washed kale/chard salad mix, baby carrots, strawberries, blueberries, a red onion, 2 tomatoes, sliced mushrooms, black grapes, cherries, zucchini, santa rosa plums (they’re small and tasty), 3 peaches, 4 valencia oranges (I plan on juicing them), 3 nectarines, a green pepper, a cucumber, a bag of celery hearts, bananas, and a container of broccoli and cauliflower. And, I saw another new-to-me stone fruit that I can’t wait to try, since the apriums I wrote about yesterday were so delicious. Anyone know what these are? They’re called mango nectarines. I know nothing about them, except that they’re still pretty firm, so I’ll let them ripen a bit before digging in (and sharing the experience with you). I don’t know what that building is, or will become, but I checked online, and the Casual Male moved about 10 blocks away. Not seeing the Casual Male there reminded me of one of my all-time favorite blog posts – from last fall, when I said good-bye to shopping at big & tall stores FOREVER. If you haven’t read my open letter to Casual Male, click here – it’s a good read that I’m quite proud of, and when you get to the picture of the store in my car mirror, know that I spent 10 minutes aligning myself in the parking lot, blocking traffic, to get that shot to line up. I do it for you, blog readers! NO. That’s a lie. I DO IT FOR ME. Your enjoyment is an added bonus, and my knowing how much you enjoy it is the best added bonus of all. COMING UP: There was another great moment yesterday that I want to share, but since I thought this post was getting a little long, I’m going to save it for next time. It involves a major Los Angeles landmark (no, not Angel’s Flight)! I’ve been a long-time member of Casual Male’s Rewards program – basically, every time I spent a couple hundred bucks there, I’d get a gift certificate for $10 to use on my next visit. As Casual Male XL was one of the two Big and Tall stores in my area, I was getting those gift certificates a couple times a year. Now, it seems, they’ve targeted me for a bigger, better Rewards program. Apparently my spending habits make me an ideal candidate for their Platinum Prestige Program – at no cost to me! There’s just one problem – I’m done with Casual Male XL. I stopped shopping there about 6 months ago (read my open letter to them after shopping there for the last time), because after losing so much weight, I found I could shop pretty much anywhere I wanted, which, by the way, is an incredible feeling after not being able to shop at many places at all for so many years. 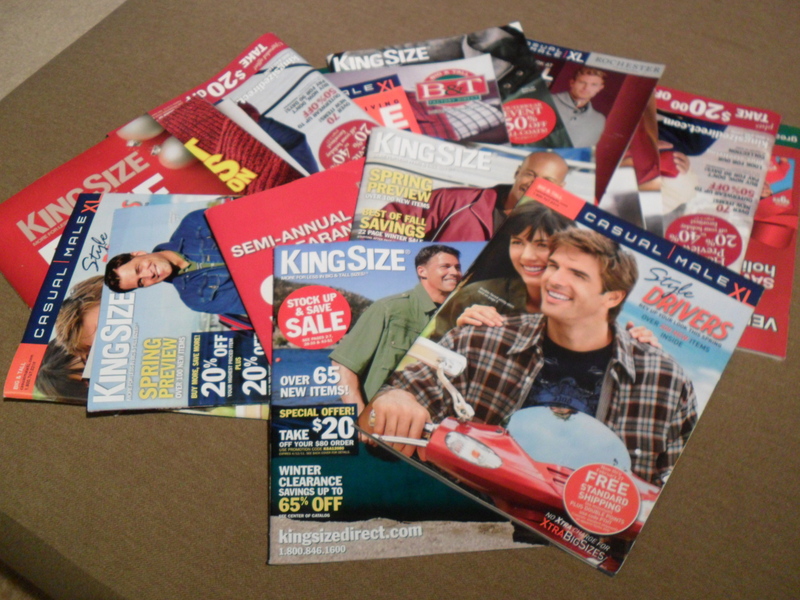 Bye-bye catalogs! You have a hot date with the recycle bin in your future. I’ve also added to my to-do list calling each company and removing myself from their mailing list. I’m done with big and tall! Done! Earlier today I ate my second ever pummelo. Earlier this month, I documented, on this blog, how I went about eating the first one (which was a process, but completely delicious), and I got great feedback from some of you about how you love pummelos, and I also got a suggestion I wanted to try, from Reinaldo. Easier way to eat them tip: just slice it! Like you would slice a tomato into little “wheels”. Then dig in into the fruit’s meat with your mouth, and discard the outer ring. Messier (because of the juice), but a lot more faster and fun. In total, I’d say I spent 5 minutes chopping apart this pummelo, compared to, I don’t know, 15 minutes the first time around? I love a good time saver, so thank you Reinaldo! I’ll be enjoying many more pummelos this way, I’m certain of it! It’s been 5 days since I’ve last blogged… my apologies to anyone that stopped by hoping for something new! It’s been a fantastic 5 days – lots of family and lots of fun, and Christmas as well! I haven’t worked out this week as much as I would have liked. I decided to make the 22nd a rest day, because my shoulder was acting up. I have recurring pain in my shoulder – little flare-ups about once a month that stem from a rotator cuff tear earlier this year. When I first started experiencing the flare-ups, I mistakenly thought I could push through the pain and work out like any other day, but nope, I can’t. It only makes it worse. On the 22nd, the pain was tolerable, and I knew I had to rest it instead of worsening it. On the 23rd, I just didn’t make it to the gym. My brother was in town, and we were sharing a car, and it just didn’t happen. On the 24th, my shoulder was feeling great, and my sister came along with me to the gym, and together, we did 45 minutes on the crossramp elliptical and then some sit-ups. I didn’t exercise on Christmas day – the gym was closed, and plus, it was a busy, family-filled day. Earlier today my sister and I went back to the gym, and I did a more varied workout: I ran a mile on the track to warm up, then did 23 minutes on the crossramp, followed by 35 minutes on the bike. My eating during the week has been pretty good, with the exception of Christmas day. The other days, I was mindful of proportions, and while I indulged in seasonal treats, I didn’t go overboard. On Christmas day, I was grazing and munching all day long, and on lots of stuff I normally wouldn’t eat (or, at least, wouldn’t eat nearly as much of): Cookies. Nuts. Fudge. Baklava. I got back on the wagon today. I haven’t done a weigh-in since the 19th (1 week ago). I know I’m up a couple pounds, and I’m okay with that – I just don’t need to know the specifics. Tomorrow I’m off to Mexico – My sister’s birthday is in a couple days, and she planned a birthday trip for family and friends. So I’m gonna wait until I get back to LA after the new year before I weigh myself again. My goal is to stay even. Oh – and I may or may not blog from Mexico… we shall see! Very tent-like – I love that! I’m wearing XL shirts now, and earlier this month even bought a size Large hoodie! On the right is my Casual Male XL Rewards card. Basically, I got a $15 gift certificate for every $200 or $300 I spent in the store (I forget which it is). For the past 5 or 6 years, I was getting an average of 2 of those certificates a year. But no more. I no longer have to shop at a big and tall store, so my rewards card has a new home: in the trash can. You can read about my final visit to Casual Male XL here – it’s one of my favorite blog posts! On the top is my card for the local Bally Total Fitness gym that I joined when I arrived in Michigan on the 9th. it was a great decision to join that gym – I went to it 13 times in 17 days, and since I only paid $20 for it, it divides out to only $1.54 a visit! Those visits include taking 2 different classes (Step and Powerflex) and doing 6 swimming workouts, during which I swam a combined total of 12,250 yards. That’s 490 total lengths of the pool, and 6.96 miles! I wanted to take a minute to let you know that you’ve lost a customer, for good. You’re my favorite big & tall retailer, and I’ve been a loyal shopper for nearly a decade. You’ve sold me clothes when I was a 2XLT, then a 3XLT, and you’ve even sold me a few items sized 4XL. But not any more. Now that I’m 134 pounds lighter, I’m buying clothes sized XL, and, as you’re aware, I can buy those pretty much anywhere. As I blogged about last week, the reason for coming was to use the $15 coupon that I earned through your Rewards program. I intended to buy 2 black pairs of boxer briefs, size XL, but, alas, this location didn’t have any in stock, although your associate there, Dana, was very sweet and even looked in the back for me. I took your lack of inventory as a sign that this was how it’s supposed to be. As for the coupon, I used it on socks instead. Thank you for consistently selling clothes that I felt comfortable in, and always carrying my size. Thank you for selling fashionable clothes, so I could find things to wear that were flattering and not outrageously off-trend. Thank you for selling “waist-relaxer” pants that have hidden side elastic panels, giving the waist a few extra inches, allowing me to buy pants in my size, but knowing that they’d stretch a little as I gained weight. Thank you for hiring employees that never looked me up and down when I walked in, realized I’d never fit in the merchandise there, and ask who it was I was shopping for (yes, that’s actually happened to me). Thank you for making my shopping experiences a little less painful and frustrating. You’ve been good to me, Casual Male, and I appreciate it. But it’s time to move on. There you are, in my mirror, as I left your store for the last time – and I’m NOT looking back. Got this in the mail today: It’s a rewards certificate from Casual Male XL, a big and tall shop that I have frequented used to frequent for years. When I was at my heaviest, and for years and years before that, Casual Male was one of about 3 stores I could go to and be assured they would have things in my size, so I did a lot of shopping there (I also did a lot of catalog shopping too). I’ve been a member of their Rewards program for years as well, and this $15 coupon was sent because I had spent $300 dollars there in recent months. I shopped there enough to get one of these a couple times a year for the past 3 or 4 years. Here’s the good news: I don’t need to shop there anymore! I’m elated to share that for the first time since, I don’t know, college, I’m small enough to start going to pretty much most retailers (some may not have many options for me, but still!). The last time I was at Casual Male, a few months ago, buying a belt (apparently spending enough to cross the line to send me a Rewards coupon), I had the thought while I was leaving that this could very well be the last time I step into this store. But now I have $15 free dollars there, and I don’t pass up free money. But what do I buy? Do they carry T-shirts small enough for me now? Come to think of it, I am ready to size down my underwear… so maybe I’ll just buy some boxer briefs. I have to admit – it’s a dilemma I don’t mind being in AT ALL.